The latest meme that’s been making the food blog rounds is called Childhood Memories. Once tagged, we’re supposed to write about 5 childhood food memories that have shaped our current culinary predilections. Last week, the wonderfully sweet Tara made me “it”, along with The Domestic Goddess and Nicky and Oliver, the hugely talented couple who write Delicious Days. There’s nothing more familiar and reminiscent of early childhood chomping than this simple, oh so pervasive but still fantastic combination. My family moved to the USA from Singapore (for the second time) in 1974. While my mother became and still is an amazing cook, she has, for most of her life, pretty much stuck to her Chinese roots when in the kitchen. That said, she did make a few concessions to “American” cuisine, chief among them a pretty mean cheeseburger, Sara Lee’s chocolate cake (take out of fridge, open box and serve), and peanut butter and jelly sandwiches. PB & J sandwiches found their way into our family breakfasts, afternoon snacks and most often into brown bagged school lunches. Smucker’s Goober Grape (pictured above) is one of S’s and my secret indulgences and an easy way to satisfy this childhood craving with just one jar. As I was saying, one of the other few American dishes that my mother excelled at preparing was cheeseburgers. And boy were these good. Honest to God, her burgers are some of the best I have ever had, far better than any I’ve found in Singapore and better than most of the ones I ate in numerous burger bars and diners across New York. She mixed ground sirloin, chopped onions, a raw egg, some worcestershire sauce, and a sprinkle of salt and pepper. Over her generous patties, she melted Kraft singles and served her burgers on toasted Thomas’ English muffins. Today, when I make my own burgers, I use the same ingredients that she did. I discovered these marvelous Shanghainese steamed soupy dumplings as a little kid in a restaurant in New York’s Chinatown called Peking Duck House. As you would expect, the restaurant specialized in fantastic Peking Duck. Unfortunately, few of its other dishes were as good. In fact, over the many years and as a result of many, many meals, my family had discovered that aside from the duck, only two other items on the menu were equally delicious–a noodle dish and the xiao long bao, which were excellent. I can’t recall when I had my first one, but they have since early childhood remained one of my all-time favorite food items. In fact, I would go so far as to say that xiao long bao have been one of my earliest obsessions and addictions. When young, I was downright embarrassingly greedy–consuming as many as 40 (and once 60) dumplings per sitting. These days, I try to limit my intake, keeping my consumption to single digits. This may just be the unhealthiest dish in my repertoire but it is one of my favorites. I’ve been eating this for the better part of two and a half decades. I have no idea whether the recipe comes from my mother, our old retired housekeeper or a family friend. It was the perfect one dish meal for a tiny tot, the perfect comfort food for a hungry college kid, and the perfect but occasional walk down memory lane for an aging chubby hubby. It’s also a breeze to make. Put a pat of butter in a bowl. Drizzle some Bovril (yup, liquid beef) over the butter and spoon in some hot rice. Stir this up. The amount of Bovril you add is up to you; just don’t put too much or the rice becomes too salty. Then fry an egg sunny-side up. Put the egg on the rice and stir the whole thing together. Eat. I discovered Foie Gras when I was 8 years old. I had attended a Christmas party thrown by a family friend. Among the many delicious treats that were being passed around was a silver tray laden with toast triangles covered with silken slices of Strasbourgian Pate de Foie Gras avec Truffe. My first taste was an utter revelation and before I knew it and to my mother’s utter dismay, I had consumed all the Foie Gras in the house. The hostess laughed off my mother’s many apologies, telling her that the only insult would be if I wouldn’t be able to eat the rest of the Christmas feast that she had prepared (well, ordered… this was New York after all). Suffice it to say, I mustered up the strength to eat everything and anything put before me that night. Yay! I was so happy to read your post. It is absolutely wonderful that you still honour your mother’s recipe in your hamburger making – and really, who wouldn’t, with such a tasty offering? Kraft singles are sometimes the only way to go. And an 8 year old CH bulging with foie gras is an adorable memory! I used to eat those Sara Lee cakes (chocolate please), layer by layer, saving the frill of icing on top for last! What an evocative post. And I love how you manage to make PB&J look positively gourmet! Oh, please, please, please try butter and Maggi seasoning sauce. Used to my brother’s absolute favorite as a child and he had to beg (or blackmail) my mom into allowing him to eat it. thanks for making food look so good. i’m a junk food addict and you’ve managed to convert me just a little. I’m very impressed with your adventurous palate at such a young age – foie gras! Most children are so finicky. OMG! 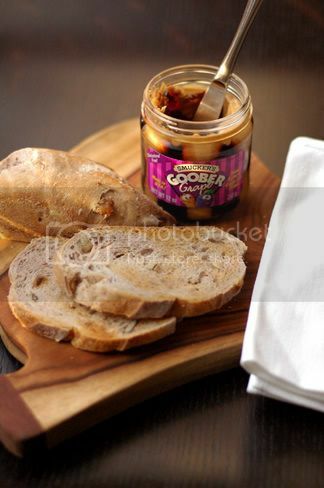 That Smucker’s Goober Grape is our favourite sweet treats in the past. we used to secretly eat it off from spoon until mum discovered and have it hidden somewhere out of reach. You make me want to try peanut butter ! As a french I have to tell you that Foie gras is not a pate, it’s just Foie Gras a kind of good by itself… because it is so good ! There is 2 kind of Foie Gras : goose more subtil and duck more powerfull. i used to LOVE that goobers peanut butter and jelly but my mother would never buy it for me!!!!! goobers pb&j on wonder bread. doesn’t get much better! I’m addicted to Maggi myself (similar to Bovril) on rice and to jazz up gravies. I really laughed when reading about your foie gras experience – mine was caviar. I couldn’t get enough of that salty, fishy goodness much to my parents dismay. When we’re little we have no clue about the cost of things we just know what we like. tara: Thanks so much for passing on the meme. It was a pleasure to write. julie: Hi, how long have you been in Singapore? I love the Peking Duck House. The meat of their ducks was always moist and the skin perfectly crisp. And unlike so many restaurants here, they served the meat and skin together. augustus: Thanks. Gotta make the Goober Grape look great, right? siu mai: hmmmm…butter and maggi sauce. That sounds great. I’ll have to give it a try. I can see why your mom wouldn’t allow him to have it too often though. tscd: If I recall correctly, I had no idea what it was. Let’s also not forget we Asians love eating liver, so it wasn’t too far a stretch. anonymous: Merci… Actually, I really only consider goose liver to be foie gras. I also prefer it as pate. I’ve eaten foie gras in many forms over the year, pan-fried, mit cuit, etc. But my favourite style is still pate over toast. J: heh heh… yah, those are two real special dishes. ruth: Another maggi sauce and rice fan. I’ll have to try this. Caviar? Woah, I’ve really only developed a taste for it in the past few years. I can only imagine your poor parents as you asked for caviar at family dinners. Those burgers sound delicious–so delicious that I’m tempted to make them for dinner tonight. I can’t believe you had foie gras when you were 8!! Lucky dog. P.S. I love the new logo! I’ve been reading your posts off an rss feed, so I haven’t actually been seeing your site lately. Oh MY GOD! They still make GOOBER? That is the most hilarious thing (stuff) ever. Awesome post, what a food-centric childhood you had! Haha! A truly nostalgic & hilarious post indeed. Yes! I fell in love wif Smuckers Gobber Grape when it was introduced into the mkt. When it was discontinued for a period. I had to switch to Peanut Butter wif sprinkles of sugar instead. Hmph! I’ve never tried Bovril wif rice. I usually drink it as a beverage or simply dunk it into my dried scallop porridge. Ok I MUX try making your Bovril Fried Rice. Sounds delish. Speaking of burgers, you shld try the burgers at Carl’s Jr @ Marina Sq or Robinson Towers. I would highly recommend 1)Charbroiled Sante Fe Chicken Sandwich 2)Guacamole Double Bacon Cheeseburger (It’s even bigger than Whopper) If U prefer Chilli, then there’s a Chilli Cheeseburger too. Their Criss-cut Fries is good 2! remembered my childhood days of bovril too. mum tried to feed me marmite – liquid vege and no way that will fit into me in those days. 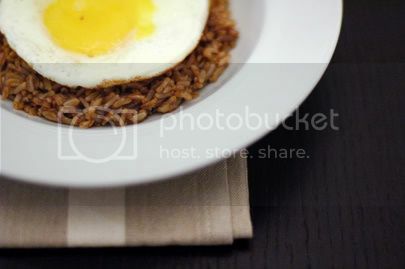 Just like u chubby hubby, dilute some bovril with hot water, fried a sunny side up chinese style ( hor pau tan ) and mixed white rice with the egg and bovril. stopped all that a decade ago as i found it too salty nowadays and my palate changes too. Thanx for the great write up. I’ve seen foie gras used in desserts in some restaurants’ menus. Am curious, but not quite game to try it yet. Any comments from anyone who has tried it sweet? Goober grape was the childhood treat I never had in my childhood. America always seemed so much better in that regard. My friends at the US Base in Japan were mystified why I kept asking them if they could get me some. Someone understands that nostalgic comforting food that is rice, bovril, butter and fried egg. Everyone else just looks at me funny when I say that is one of my favourite dishes. There are still places that sell the real beef Bovril. The vegetarian version is VILE and an ABOMINATION!! When desperate, I make do with Marmite..but it doesn’t even come close to Bovril! I also love have fried egg on bread with bovril. The yolk must be soft enough to ooze but not to drip. Not easy I tell you.!! What a wonderful article that has me sniffing on nostalgia. He loves bovril in porridge (had mine cooked like risotto which was how my grandma cooked for me) and we can eat a pot of this by ourselves on a rainy day and just enjoying each other’s company.. Loved Sara Lee cakes just out from the freezer.. never left it at room temperature coz it goes real quick! Lastly, my grandfather used to crack a raw egg into the milo powder/condensed milk mixture and then pour hot boiling water over it before stirring it.. and what a difference steaming white bread slices make..